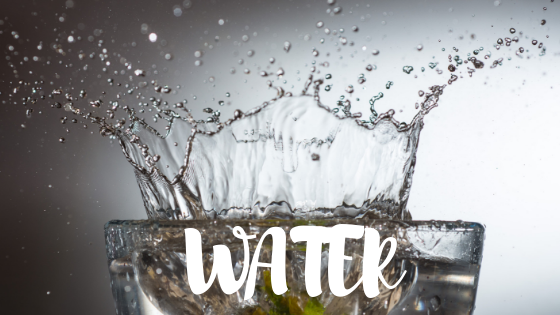 Our body is made up of 60 percent water! With that statistic alone, you’d think staying hydrated is a priority. Hydration is crucial to our health but most of us, including me, don’t do it!!! Maybe I haven’t excited you enough to run to the faucet but what if I told you our blood is 90 percent water? Our organs depend on H2O to function and to help the body lose fat. And a bonus, being hydrated prevents premature wrinkling!!! It lubricates the joints. Keeping our joints lubricated keeps the pain away! So, why don’t we drink enough water? Sounds easy enough. Get a cup, walk to the spigot, fill and drink. If it’s really that easy, if it prevents wrinkling for free, why is everyone (including me) struggling to do it? Because it’s a habit, which takes time to adopt and repetition to stick. I was raised on Pepsi (when I became old enough, I quickly switched to Coke because, well, it’s better). The only change I’ve made is switching from fully loaded Coke to Diet Coke. I can tell throughout the day the noticeable difference in how much better I feel if I’ve been drinking water. Some days I’m doing great and some days I drink Diet Coke all day, which means not only do I feel like crap but my workouts and sleep suffer. I love Diet Coke, the taste, fizz on my tongue and enjoy when splurging on pizza or burgers. Days I drink with breakfast and have more later are usually times when my anxiety is heightened. This happened yesterday. I didn’t drink coffee, I didn’t pretend to drink water, just headed straight for the Diet Coke. It is ok to enjoy Diet Coke in moderation but I need to actually moderate! So the million dollar question is how to implement #3! One option is to quit cold turkey, which won’t work because it’s now a bad habit. So how do I replace with a good habit? I’ve decided to transition without giving up completely. I am going to start my day no matter what with eight ounces of water. After that first cup, I’ll allow myself to explore all the coffee and Diet Coke I want!!!! By taking this baby step drinking more water, I hope to add more throughout my day. I’ll feel noticeably better, so maybe I’ll drink another glass! I’ll feel more pumped for my workout instead of tired and drink more water! Will this work? Hard to say. Drinking water is the easy part, letting go of the old habit is the hard part. I’m going to try my best! I have my water jug filled and ready to go. One morning at a time I’ll be mindful of what I’m drinking. When I feel success with the baby goal, I’ll add another step. Do you struggle with drinking diet crapola? How about stress eating??? ?